Hoover® upright commercial vacuum cleaner with dirt cup. Rugged commercial grade construction built for everyday use with a 6 amp motor. 2-brush agitator, 50'L power cord, 12"W sweep path and automatic carpet height adjustment. Polycarbonate fan and base, steel axle and side wheels and reinforced handle bail. E-Z Empty dirt cup replaces the need for bags. 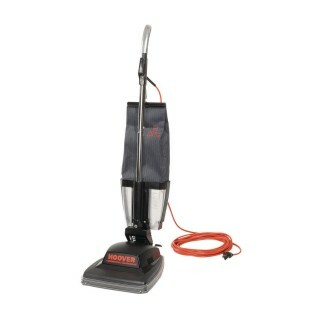 Hoover® upright Guardsman vacuum with dirt cup. Rugged commercial grade construction is built for everyday use with a 6-amp motor. Features include a 2-brush agitator, 50'L power cord, 12"W sweep path and automatic carpet height adjustment. Other features include polycarbonate fan and base, steel axle and side wheels and reinforced handle bail. E-Z Empty™ dirt cup replaces the need for bags. Lay-flat handle cleans easily under furniture. UL, CSA and OSHA listed. 2-year limited warranty. 12" cleaning width.